This cruise on the Oceania Marina caught my eye because 1) it actually comes to the Atlantic coast of Canada the second week of April (the earliest I have seen) and 2) it ends in Barcelona – a destination I would appreciate. In between it goes to Ireland, France, England, France again, Spain, Portugal, Spain (again). It takes twenty-eight days out of New York. Now, I don’t want to sound like a publicity writer for pricey cruises. If I ever did go on such a jaunt, I’d prefer a ship much smaller (the Marina can handle 1258 – 1447 passengers). And – in truth – I would rather go on a Freighter that only handles a dozen or so paying passengers. Oddly, the main character in my work-in-progress, Alison Alexandra, went on such a Freighter cruise and enjoyed herself immensely. But she’s that type of gal. However, Alison Alexandra also enjoys the finer things in life (she also had a hearty jaunt on The Orient Express), and would not eschew the accommodations and offerings aboard The Marina. In addition to the extensive voyage, and numerous ports of call, (and the complementary 24 hour room service) Alison Alexandra would enjoy a night or two in the twelve dining venues offered. Alison Alexandra is not (unlike her author) much for desserts. I dreamed I was a prophet. The prophet Amshel, which is my Jewish name. And, I could talk to God. And I was looking at myself in the mirror. And I was looking back at me. I mean, Franz was in the mirror, looking back at me – the me of Amshel – who was looking in the mirror. Except, I was as much me looking out, as I was me looking in. The wall behind the prophet was painted red, while the one behind Franz was of brown wood. They both could raise their fists at each other, and sometimes did. In unison, of course. That was the law. And then God spoke, from somewhere behind the mirror, but He did not speak to Amshel. He spoke to Franz. And his words echoed those of Amshel, who also had his hand upon his heart. “In this, God, you have erred.” And the two faces stared at one another, their fingers clutching at the garments they wore. Is there sense to be made? Did Kafka have the answer? 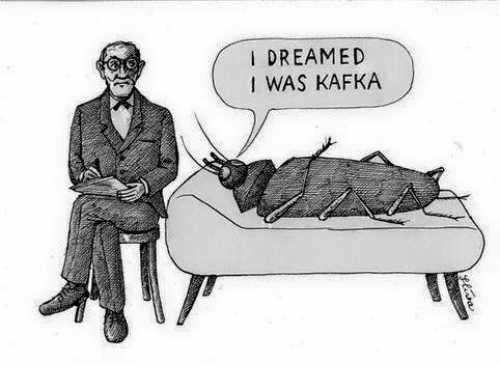 Or was Kafka the question? A couple of days ago, I wrote about finding a particular (and peculiar) edition of Kafka’s book, The Metamorphosis, in a bookstore. I went back yesterday to have another look. This is what happened. Having seen this plain cover, hardback “The Metamorphosis”, I wanted to take another look, and track down the publisher. There had been ten or so copies left, and I assumed there would be no trouble in doing this. However, when I started to search on the SALE table where I had seen it, there were none present. Odd enough in itself, but now, on the same table, there were a dozen different copies of ‘“The Metamorphosis”, still hardback but with a dust jacket. There was an image of Kafka (or, at least, a form all in black) modeled on one of the extant photos of him. There was also text: “What on earth has happened to me?” Across the top was the word METAMORPHOSIS and across the bottom was FRANZ KAFKA. The colour of the dust jacket was a blue/green. I might – on the very outside of possibilities – had thought that all the copies I had seen previously would have been gone … but, I never envisioned a new set of different copies of the book. I queries a clerk (who had not been present the previous day) about those other copies of Kafka. All he could say was that the displays in the store had been changed the day before. Yes, I even did go to look on the shelves (in addition to the display tables), to see if the plain Metamorphoses might be there. It was not. Nor any other books by Kafka, neither. So, I wandered in my own version of Kafkaland for a few minutes, before I departed. And – of course – I was left thinking: had the original, plain books have their own metamorphosis into the new. Well … perhaps not the book. Most of what Kafka wrote was not published in his lifetime. Of course, most of what Kafka wrote did not survive his lifetime. It is estimated that be burned 60%-75% of all that he actually wrote. But, one of the books he did have published was The Metamorphosis. He took such an interest in it that he made special requests about the cover art. He wished that the vermin into which Gregor Samsa turned, not be depicted on the cover. He was adamant about it. His wish has not been kept over the decades, but there isn’t much you can do once you are dead. This came to mind when, yesterday, I passed a book store offering various discounts and bargains. Three books for $16 – that sort of thing. And, a vast array of books, from Tom Sawyer to contemporary thrillers to scientific non-fiction. But, on a prominent corner shelf, was a stack of Kafka’s The Metamorphosis. Hardback. Published last year in Britain. Going for $15. A plain, brown cover with no book jacket. Author and Title. That was it. And, the thing is, I was tempted to buy it. I imagine I have read the story ten to a dozen times. Over the years I have had three or four copies. I am slowly divesting myself of more and more possessions. Yet, I gave it a good look-over. Clean pages. Easy to read. No cramped text. No illustrations. It would have made Kafka proud. If The Wind Howls At Midnight, Should It Howl At Noon? Because, that is how the wind doth blow. From the ocean (where it gets a good start) across the shore and up the hills. And it doesn’t seem to want to stop. Whistle, whistle, whistle. I think it makes more noise through the bare trees than those, at other times of year, with leaves. The branches shiver and the house shakes and the roof does not sound as secure as one would like. Apparently it is not a precursor of storm, for the sky is blue save for some well-tossed fluffy clouds. And they do like to tumble in the wind. But, of course, they have no place to fall. So, the winter sand from the street whirls, and dust balls tumble along, and it is best to turn your head away from the grit. It’s better than being tossed across the waves of the sea however, think I. And a sign of how much the wind howls? A chair under the doorknob. A Gypsy confronted me today, and I was in the mood for a bit of sport. Her age was difficult to tell – certainly a decade older than me. In her swirl of shawls and dangling jewellery, heavy make-up on her face, she could almost have been in disguise. 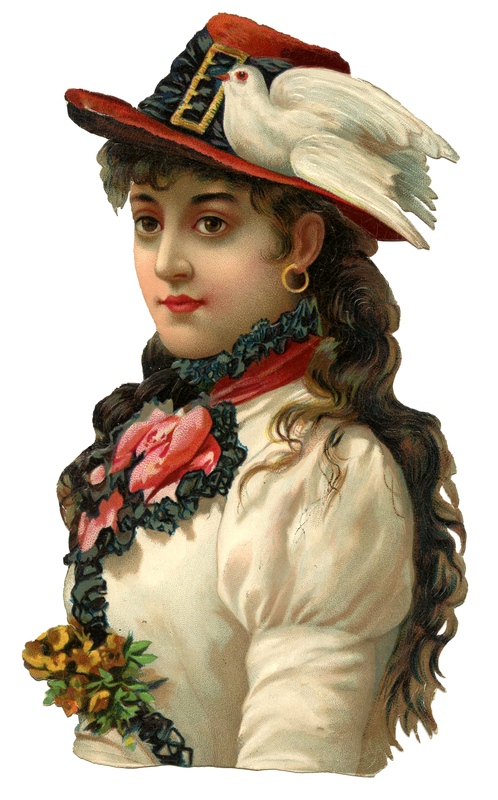 She peered at me with an intense sigh, attempting – I am sure – to penetrate my own disguise. “You are a Jew,” she said. “And you a Gypsy,” I replied. She seemed pleased with my response, for her professional smile became real. “Are you going to banter with a poor old Gypsy woman, instead of barter? That would make you suspiciously like one of us.” She said this with a growl in her throat. “They will try to do us all unto death,” she said harshly, and turned away. I had the fear she was going to leave me without another word, but what she did was to spit fulsomely onto the street. “They can’t kill us all,” I said, but I knew she heard the doubt in my voice. She slowly faced me again. This transaction would make her loose my hand, which is what I wanted most of all. She had frightened me, for her eyes and face were full of truth. I know the truth. I know it when it presents itself, stark and unobscured. I search out truth endlessly, yet still can flee at its approach. As in her eyes. But she gripped me more fiercely, and pulled my hand up. She at last lowered her eyes and looked closely at my palm. She rubbed the lines and whorls of my skin. She touched her finger to her lips, and spread the moisture along my hand. She released my hand, rubbed her fingers across her sleeve. Suddenly her face was full of the most beautiful smile, and her laughter was genuine. I dug deeply into my pocket, and feared that I may have overpaid her. But, perhaps, that is not possible. I glean through many sources (some of them disparate) after information of which agents and which editors have purchased recent books that are similar to one of my manuscripts. When I find someone I think will be compatible to some of my work, I research them. Then, if I think they would have a reasonable interest in my manuscript (and there can be a variety of reasons) I’ll send a query letter. I prefer to go through this process of finding names a number of times in a row, instead of finding a compatible person, then immediately sending a query. So, when I find a person I plan to contact, I send this information to myself in an email. It can be weeks before I actually send a query to an agent or editor, and then it can be two or more months before I hear a reply. Last week I came across the information that John le Carré has a new book coming out the end of this year. I adore John le Carré. This announcement unusually named both his agent and editor. I sent both to myself, and I imagine I would get to them in the next two or three weeks. This morning, April 1st, I had notification of a rejection by an agent for my NATO Thriller. It was a refusal sent through the portal of the agency (which happens more and more). Since it was not an actual response by the agent, I had to go to my Sent file to see who I had sent the query to. Uh-huh – it was the same agent as John le Carré. So, I actually got rejected before I sent the query. Well – anyway – that’s how writers think.